Photos submitted by users. This will help you in building your own machine. Building the base plate. View from the top. 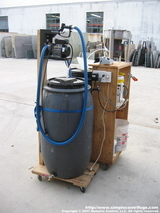 The completed machine. 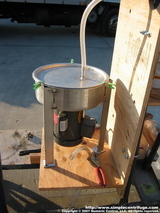 This machine is being used to process coconut oil. 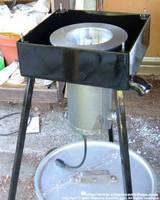 It was made from some stainless steel plate and a stainless steel cook pot. Very nice fabrication. A very nice machine built after our design. Note how Ed offset the output, very nice. Ed's current setup. 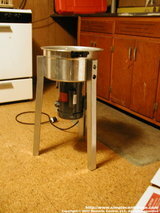 The top pot is the feed tank, centrifuge in the middle with the finish tank at ground level. 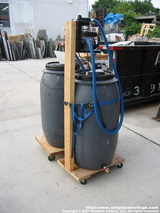 Update 11/30/2007: Just an update to let you know that the centrifuge is working perfectly!! I currently have a '85 Isuzu Pup running 70% processed crankcaes oil/30% diesel and a 1980 Mercedes 300d running 25%crank 75% diesel (just started the process with the Mercedes and expect to get it down to 50/50 at least for the winter)... Ed Ed writes: I fastened a tranlucent domed plastic lid, the pink thing, under the clear cover .. Directs the flow going out of the rotor downward .. Really works slick. No splashing at all. 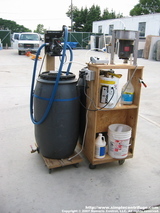 Machine Paul built to remove Magnasol from biodiesel. This is another shot of Tom's machine. We really liked his creative use of readily available materials. 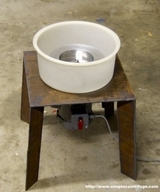 Tom G. sent us another photo of his centrifuge. This is the simpliest of designs using just basic tools. This splash wall is made from a dog dish. 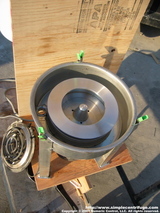 Tom G. who purchased one of our first bowls sent us these pictures of his fine machine. Some customers lack the space to do a full gravity system. This latest photo from Vinny shows his current setup in his basement. 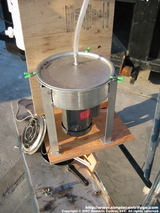 He's using a small pump to lift the dirty oil into a small reservoir prior to heating and passing through the centrifuge. 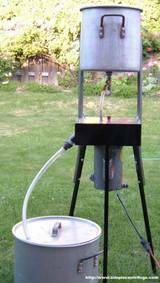 He writes: By applying your suggestion to install a reservoir with recirculating drain line, I now have a simple oil feeder to go with my simple centrifuge. No more fiddling with the metering pump. 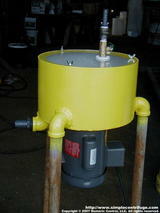 No more loosing prime on metering pump due to vacuum leaks. This is a real break through.